Our two-in-one formula gently removes buildup and hydrates the scalp for thoroughly cleansed hair with a soft, touchable feel and full, healthy-look. Infused with a woodsy blend of aromatic Cedarwood, Sandalwood and Eucalyptus essential oils, our formula leaves scalp refreshingly clean and flake free. A must-have for multitaskers. 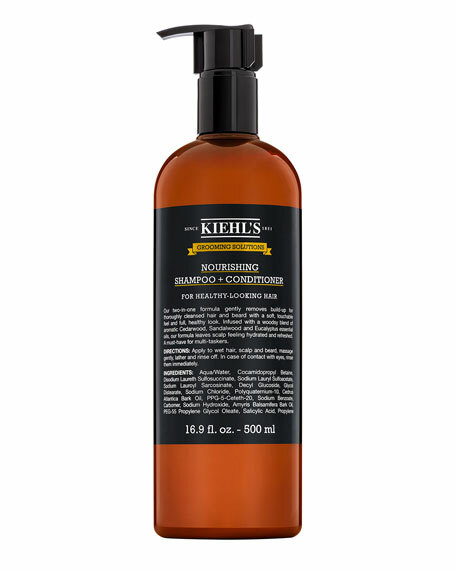 Sulfate and Silicone Free formula creates a creamy lather to gently cleanses hair and scalp. Plant derived Arginine nourishes scalp while sustainably sourced Pracaxi Oil smoothes and conditions hair for optimum health. Blend of natural Essential oils including, Eucalyptus, Cedarwood and Sandalwood provide a fresh, woodsy, aromatic experience. Daily. Apply two-in-one shampoo and conditioner to damp hair, lather, rinse and repeat if desired. Rinse completely. Towel dry hair and style as usual. 500 mL/ 17 fl. oz. This deeply moisturizing formula leaves hair and scalp healthy and hydrated without weighing hair down. Appropriate for all hair types. Jack Black True Volume Thickening Shampoo, 16 oz.